Inspiration can come from anywhere, and inspirational stones bring together the beauty of language and nature. We offer both in-stock and custom rocks featuring messages that will motivate recipients to apply the meaningful words to their own lives. 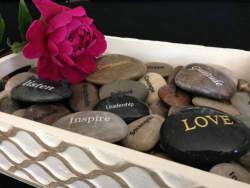 Our engraved stones are natural river rocks that come in lovely colors and sizes perfect for a pocket, in a hand or on a desktop as a reminder. The black wording is highly durable when engraved, while printed inspirational glass stones are ideal for display. It's easy to purchase your inspirational stones in bulk, making them the perfect gifts for large groups and events. If you don't see exactly what you need in our quick/in-stock items, we will happily customize motivational rocks or any of our other products for you. Engraved Inspirational River Stones 1"-2"